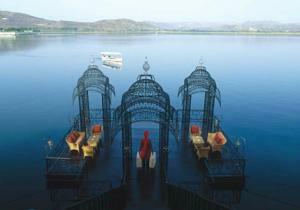 Situated in the middle of Lake Pichola, Taj Lake Palace is built with marble and features majestic architecture. It offers a full service spa and customised programmes including site-specific yoga sessions. Rooms come with butler service. For a truly local experience, the hotel offers guided heritage walks, astrology sessions and cultural shows. Leisure facilities include a 24-hour fitness centre and a hot/cold spa pool. There is also a shopping arcade, games room and business centre. Taj Lake Palace boasts rooms with beautifully carved wooden furniture and luxurious silk fabrics. Offering garden or lake views, each room has a flat-screen TV and DVD player. Pontoon restaurant arranges for private meals on a floating platform while Gangaur offers dining on small boats while meals are prepared in a floating open kitchen. Amrit Sagar Bar offers a selection of cigars, sheeshas and wines. The hotel is just 1 km from the city centre. It is 4 km from Udaipur Railway Station and 26 km from Maharana Pratap Airport. Rooms: Hotel Rooms: 83, Hotel Chain: Taj Hotels & Resorts. Wi-fi is available in the entire hotel and costs INR 221 per hour. Free! All children under 12 years stay free of charge when using existing beds. There is no capacity for extra beds/cots in the room. American Express, Visa, Diners Club, JCB, Maestro The hotel reserves the right to pre-authorise credit cards prior to arrival.